If your want to just browse through some of the OpenSS7 working directory, you can walk through the directory from this page. From the diagram, select the major project area that you are interested in and a number of successive screens will take you to the code in which you are interested. Please be sure to read the licensing terms before using the code viewed here. Application code includes some old SS7 Codecs as well as the newer frameworks and application code for HLR, SMSC, CS/AIN, etc. Select the magenta block in the diagram to view code for these components. ISDN signalling stack code includes the STREAMS modules and multiplexing drivers that implements the various ISDN and ISDN Q.931-related components of the ISDN stack, such as BSSAP, V5.2, GR-303, H.225.0. Select the blue block in the diagram to view code for these components. SS7 over IP code includes SIGTRAN M2UA, M3UA, SUA, TUA and Tekelec's TALI. Select the blud block in the diagram to view code for these components. VoIP signalling stack code includes the STREAMS modules and multiplexing drivers that implement the various protocols of the VoIP stack, such as H.225, SIP-T, BICC. Select the blue block in the diagram to view code for these components. MG Switching code includes the STREAMS modules and multiplexing drivers that implement the various bearer switching components of the MG Switching stack, such as CH, MX, MG, MGCP, MEGACO, H245. Select the maroon block in the diagram to view code for these components. SS7 device drivers include drivers for hardware such as the ACB56 card as well as IP-based drivers for SS7 over UDP and M2PA. Select the green block in the diagram to view code for these components. 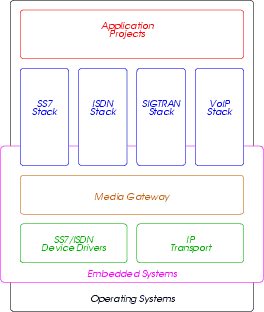 Transport stacks include STREAMS based drivers for the Stream Control Transmission Protocol (SCTP), TCP, UDP, RTP and SSCOP-MCE. Select the green block in the diagram to view code for these components. Select the maroon block in the diagram to view code for these components. Select the black block in the diagram to view code for these components. The SCTP Linux Kernel implementation can be viewed here. The SCTP STREAMS implementation can be viewed here.